Shoulder screws are types of machines screws that are known for their versatility and unique features. The screw comprises the head, the shoulder, and the threading. The head is designed to have the largest diameter. The shoulder is differentiated by its length and diameter. The thread’s diameter is designed as smaller than the shoulder diameter. The manner in which the screw is designed makes it ideal for various applications. The construction of screws makes them particularly useful for rotary movement applications. They can be used as shafts for rotating bushings and bearings. Other uses include guides, axles, and pivot points. While these are some general application examples, shoulder screws are also used in applications of particular industries. 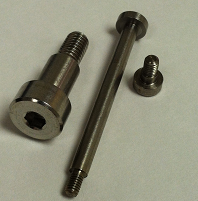 • Automotive: You will often find shoulder screws in mechanical and automotive applications. A simple application is attaching gears or wheels to a system. They are also well-known for being used as a fastener for linkages and pulleys. • Medical: Shoulder screws are used as a fastener in component assembly and alignment maintenance. They are essential in medical applications such as orthopedics and surgery tool manufacturing. • Storage: Stands, fixtures, and enclosures of various sizes are used by industrial and commercial companies. Shoulder screws are used to provide the right amount of strength and stability to the stands and enclosures when they are used in an application. • Plastic Injection Molding: The screws are generally used for aligning the two halves of the mold, allowing them to open and close for the plastic injection molding process. In this particular application, the shoulders screw is used more as a linear guide rather than a fastener. • Electronics: Electronic hardware is another well-known application for shoulder screws. The most common application for shoulders screws is that they are used to secure the printer head of a printing machine. Thus, shoulders screws have the capabilities to provide varied solutions to different industries. This entry was posted in Screws and tagged machines screws, Shoulder Screws on March 13, 2014 by Jim Groshans.